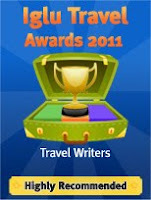 My year of getting published: Interview with a Travel Writer..W. Ruth Kozak. Interview with a Travel Writer..W. Ruth Kozak. Today we are talking with travel writer W. Ruth Kozak, editor and publisher of TRAVEL THRU HISTORY, a travel 'zine that gives new writers a place to be published. Ruth is a published travel journalist, historical fiction novelist and playwright. She also instructs travel, memoir and creative writing classes. I have been writing for as long as I can remember, most certainly since I was 10 years old. I first started writing little plays for my playmates and then plays for my classmates which were usually to do with the war (WWII) because we all had family members overseas. I started writing historical stories when my family moved across Canada by train when I was 12. During my teens I wrote several historical novels and that got me obsessed with other countries and other cultures, especially those in the Mediterranean area. Now I combine travel writing with my research trips for historical fiction. In 1981 I published my first travel article about a trip to Greece and that convinced me this was a new genre where I could make my mark as a writer before attempting to publish a longer piece of work such as a novel. Since then I have published many travel articles and got another big break in 1993 when I was invited to work on the APA Insight Guide of Vancouver and Environs. I did the “Trip and Tour” section of that travel book. Now I am editing/publishing my own travel‘zine - a new site for new writers focusing on history & archaeology; culture; art & literary trips; exotic adventures and travel memoirs. 3. What advice would you give to someone who wants to break into writing? You learn to write by writing so if you want to break into the freelance market you must devote time to your craft and practice it just as musician practices every day to learn an instrument. It’s hard to stay disciplined sometimes but you must. And it’s easy to get discouraged, but you have to keep trying and honing your craft. Take classes, attend workshops and learn what it’s all about to be a writer. At this time it seems much more difficult to get accepted by the major newspapers and many of the others don’t pay as much as they used to. There are too many ezines that are willing to take your work (for free and for their own benefit) so that makes it tough for us experienced writers, though for newbies it’s a good way to get your work in print. You just have to keep researching markets, sending stories out, and (like playing Bingo) you’ll eventually win. The reason I made the decision to start my own travel ‘zine was so I could mentor new writers, some who came out of my travel writing classes, and give them an opportunity for a paid publication. My to-be-read pile is up to the ceiling, but I do like reading what I can of the genres I write (travel and historical fiction). When I’m preparing for a trip to a new destination I will usually chose a travel book to read about it. I really liked Jan Morris’ “Venice” which I read last year just before I went there. When I went to Chile I read a lot about the country and fell in love with Pablo Neruda’s poetry. I visited all three of his houses which was a big thrill. Until recently I’ve usually traveled alone. As I’ve lived in and visited Greece since 1978 I feel quite relaxed about traveling all around that country on my own, and often camp there. I’ve also traveled in Turkey and across Europe from England to Greece by bus. I’ve only gone on a group trip once and that was a trekking holiday in Morocco. I much prefer my own company or that of a favorite close friend because that way you get to meet the locals, and talk to people along the way. I’ve never had any great challenges. I guess I’m a gypsy at heart. Well, of course Greece is my second home and I return there as often as I can. I am also very fond of Turkey and I’ve traveled there several times beginning in 1975. England/Wales is part of my family heritage so I have roots there. And my new ‘favorite’ place is Chile. This is a wonderful interview and I think Ruth is a great travel writer and teacher. She has certainly done a great deal of travelling and knows what she is writing about. Glad you enjoyed the interview. Thanks for stopping by and sharing your thoughts. Sounds like you've taken a course with Ruth? Ruth has just given me my first paying assignment at travelthruhsitory, and I've enjoyed working with her. Her love for writing, travel and history shines through, and she has obviously set her website up for the right reasons. well done. what the name of your article...will look out for it. Great interview! Thank you for the advice, Ruth!! Very Good articles , you make some interesting points .